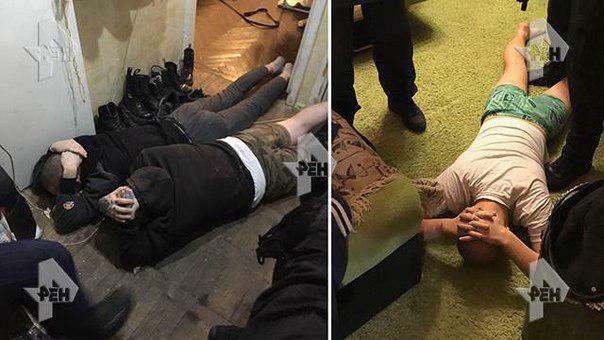 On February 1, in Moscow, Russian FSB has raided several flats and arrested 10 people under « conspiracy charges ». All of them were later released, after all-day interrogations and physical tortures, except one person, Azat Miftahov. He is accused of « fabricating explosives » and being a member of a « radical anarchist organization Narodnaya Samooborona » (Peoples’ Self-Defense). This organization has become, during last year, the main target of police repressions in Russia : several members of this group were arrested, tortured or threatened. Some of the members had to leave the country under a risk of long prison terms and tortures. One of the arrested anarchists, Daniil Galkin, has reported about tortures. After his arrest, during 2-3 hours he was beaten up and tortured with electrochoc in the police car. Under torture, Galkin was forced to say that Azat Miftahov, was anarcho-communist and took part in anarchist actions. Galkin was forced to give an interview that was compromising anarchists, to a federal TV-channel « First channel » (Perviy Canal), and promise to « collaborate with the police by providing information about anarchist actions ». In the police station of Balashiha, Moscow region, Galkin saw Azat : he was threatened by the FSB officers, and his arms were wringed. According to Galkin, Azat « did not look like a human being » because of tortures. He also said he heard screams of one of the arrested women activists, who was kept in the room next to his. He also heard that one of the arrested anarchists cut his veins and took some pills in order to avoid further tortures and thus avoid giving any information about other comrades. According to other witnesses and journalists, this person is Azat Miftahov. Azat was kept in detention in that police station until late night, he was refused to see his lawyer. At night he was guided out of the police station, right in front of his lawyer who had been waiting for him, and conducted in an unknown direction. We do not know anything about his actual location, as for February 2, 18:00. We think he’s still tortured and forced to give information about his comrades and himself. For reminder : currently in Russia (and the recently annexed territories, such as Crimea) there are several penal cases against anarchists under « terrorist » charges. Here are some of them : the « Network » case, the case against anarchist Vyatcheslav Lukichev, the case against anarchist Kirill Kuzminkin, the case against Crimean anarchist Evgeniy Karakashev. Please indicate « solidarity donation » when making your transfer. Previous post: Riot Turtle in the Enough 14 Info-Café: What was that tree from #HambacherForest doing in a meeting of the Coal Commission?